We love Wisemans Ferry. It is one of those no-brainer destinations. In less than one hour, you are in a country village that is surrounded by National Parks. 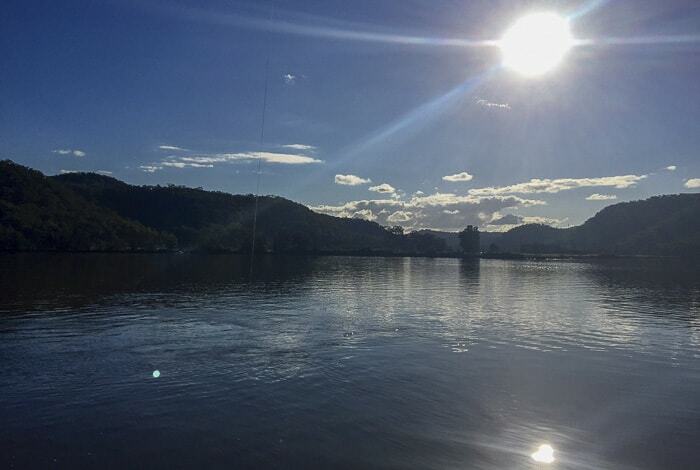 There are beautiful water views of the Hawkesbury River and the sandstone escarpments of the area are an impressive sight. 1. Wisemans Ferry Park is great. NB Wisemans Ferry is often misspelt, it’s definitely as spelt here rather than Wiseman Ferry, Wiseman’s Ferry, Wisemen Ferry Wisemens Ferry or Wise Men Ferry. No really! 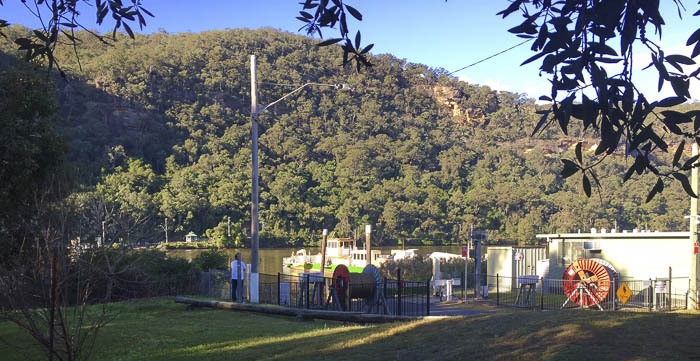 Wisemans Ferry is one of the loveliest simple day trips away from Sydney, read our full list here. But it makes a wonderful and very easy weekend away from Sydney too. Wisemans Ferry used to be the main land route from Sydney to Newcastle. It used to be very busy, now it’s a quieter place. Maybe, this is the reason why the local business people named their Association, the “Wisemans Ferry Forgotten Valley”. 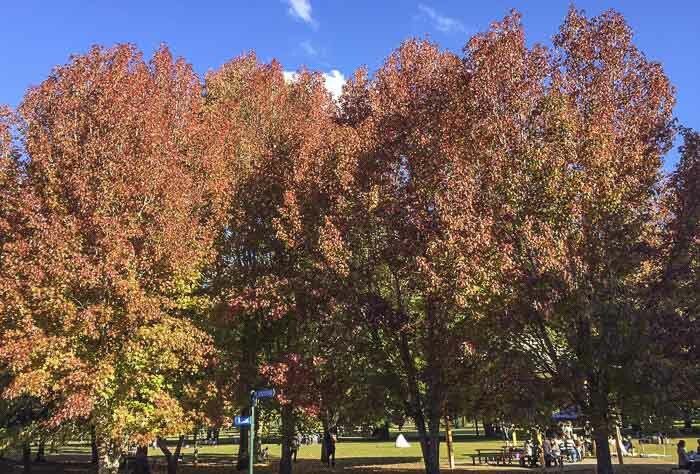 As well as its undeniable beauty, especially in autumn when the leaves change its colour into bright oranges and reds, there so many things to do in Wisemans Ferry that you should not “forget” Wisemans Ferry, when you make weekend plans. Next to the shores of the river, this park has plenty of car spaces, lots of shade, table shelters, electric and “bring your own wood” barbecues, volleyball net, walking tracks, public toilets and the most important, lots of space to let the children play and run. If you feel too lazy to pack for a picnic or you are in need of a cup of coffee, there is the Convict Trail Kiosk that offers burgers, hotdogs, toasties and even fish and chips. 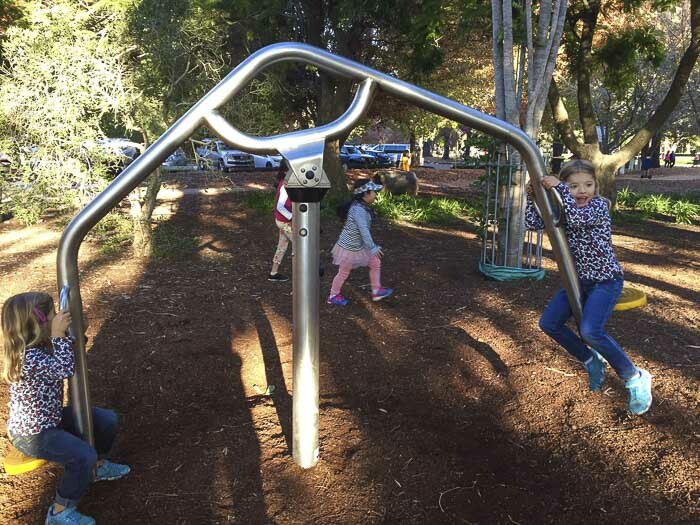 The Wiseman Ferry playground has the best seesaw that I have ever seen (a spinning seesaw; my kids had a blast) and it has lots of swings, too (ooh yeah!). Also, it has an obstacle area with some good climbing trees. If you have intrepid children that go straight into the water, then you will probably prefer the boat themed Oval Playground, next to the Bowling Club. It is fenced and it has a couple of picnic tables and public toilets. This hotel, with its country feel and character, has “Kitopia”, an out of the ordinary play area. If you’d like to stay at Wisemans Inn check prices and availability here. Other eateries to take into account are the Wisemans Ferry Bowling Club which is not far away from the previously mentioned Oval Playground. The Wisemans Ferry Grocer and Café sells take away homemade pies, and the popular Busby’s (note there is an open fireplace in winter, so it might not be such a great idea if you have little children despite the good views over the river). 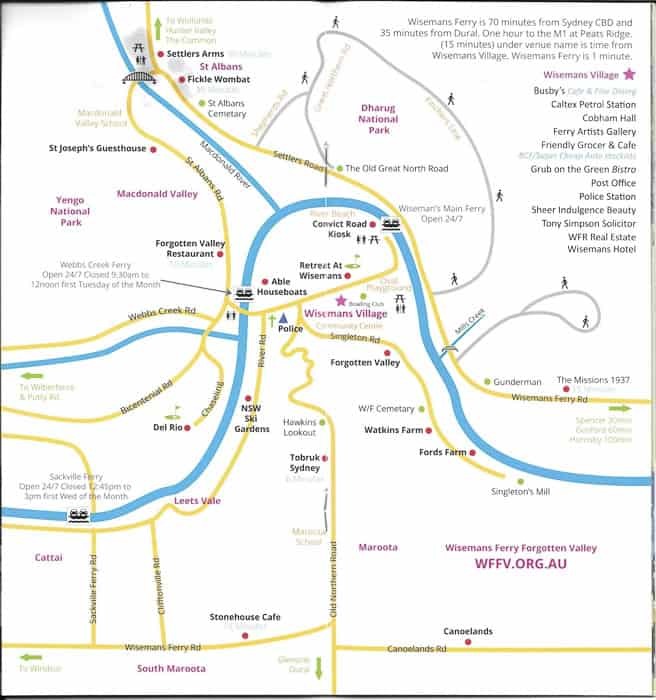 One of the best Wisemans Ferry things to do is to pick your own nectarines at Canoelands Orchard or buy direct the other fruits that they produce such as plums, peaches, tomatoes, passionfruit and blueberries. 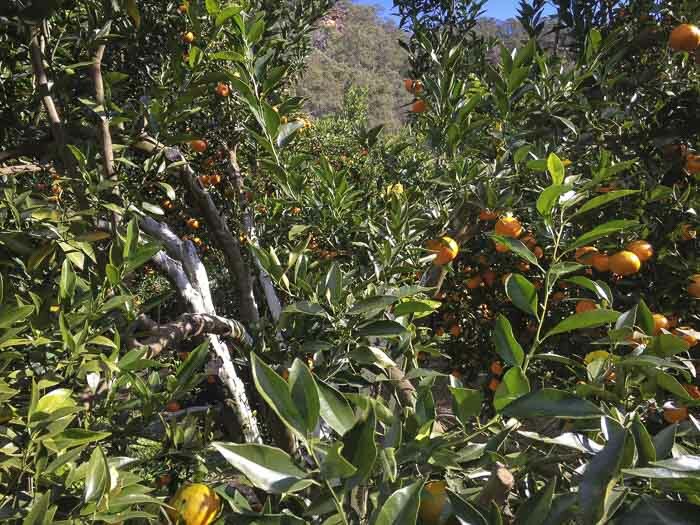 During mandarin season, very close to Wisemans Ferry, there are two farms that you can visit: Fords Farm and Watkins Orchard, which is our favourite. Watkins Orchard started in 1836. Mr. Mark Watkins was very kind with us. He spent a fair a bit of time explaining to us –with pride- the insights of how to grow mandarins. For example, did you know that mandarin trees need sunscreen protection to be protected, too? 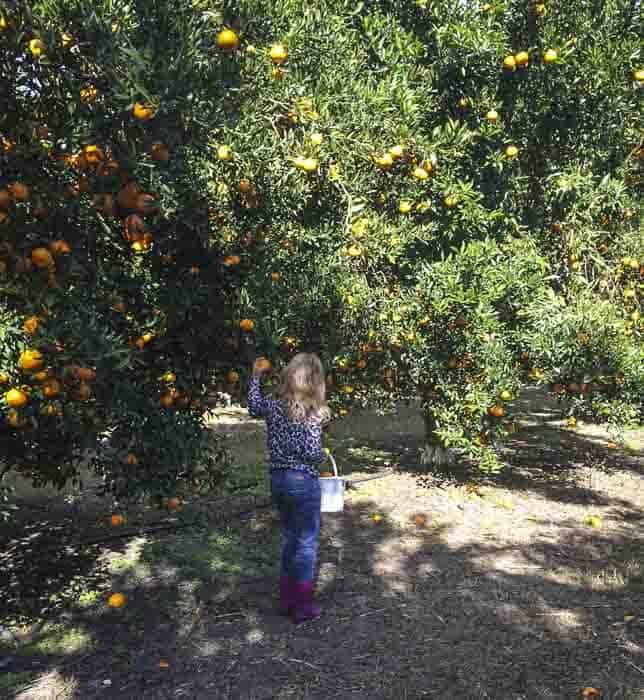 Watkins Farm produces delicious mandarins free of chemicals. 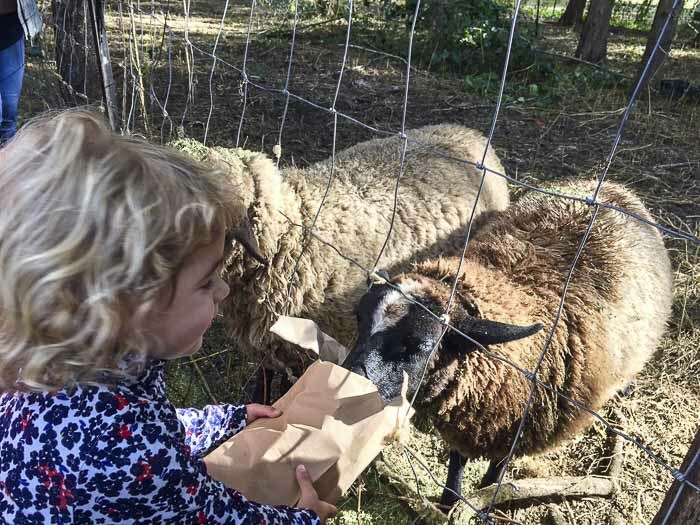 Both farms sell local products such as honey, eggs, preserves; and both of them have picnic facilities and farm pets. There is no doubt that your children will have a great time! Please, when you go to pick your own mandarins, be respectful. We talked to different farmers over the last years and all of them mentioned to us that some people don’t follow the rules of the farms. Don’t take home more mandarins than the ones that you paid for. Let’s be responsible citizens and help our local farmers with their businesses! Children always love it and it is free!! There are, in fact, two cable ferry crossings, both are free and open 24 hours / 7 days a week. Read about the history of the cable crossings here on www.afloat.com.au. Explore the historic St Albans with its iconic Settlers Arms Inn. Go bushwalking (Devines Hill loop in Dharug National Park, The 11km track, Dubbo Gully Loop Trail or Grass Tree Circuit, the easiest one and suitable for the hole family). Learn to water ski at Wisemans Ferry Water Sports. Play a round of golf. Wisemans Ferry Golf Course and Club is open to non-members. Experience the outback without having to drive miles in Tobruk Sheep Station that offers daily shows and much more. Camp in Mill Creek Camping Area or Ten Mille Hollow Camping, both inDharug National Park. Go for a scenic drive. This page contains some good suggestions. 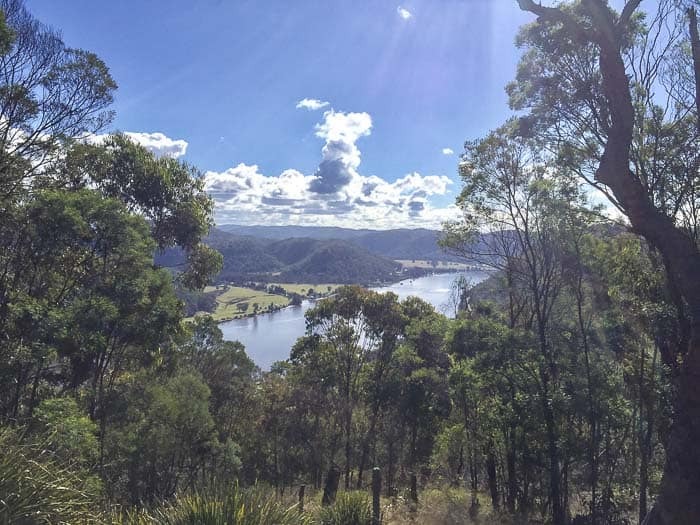 If you are coming from the Old Northern Road, don’t forget to stop at Hawkins Lookout, it offers spectacular views of the Hawkesbury River. If you are planning to go to Fords or Watkins Farms, don’t try to use Laugtondale Gully Road (a shortcut through the National Park) as the GPS might let you down. Hornsby Council has closed this way for good reason. 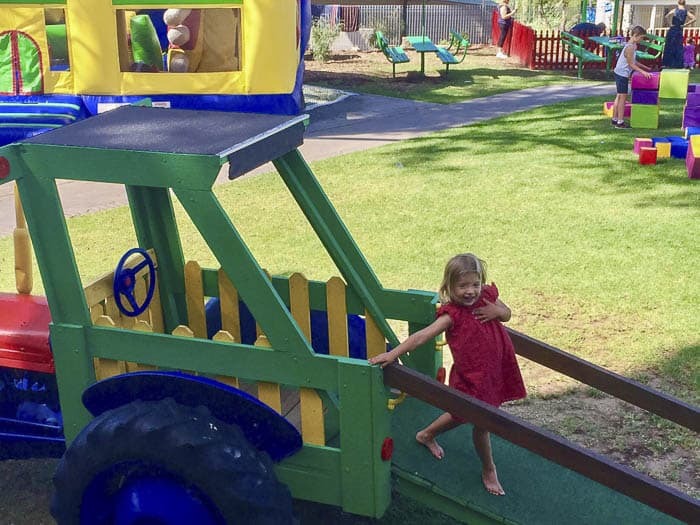 Friends of mine have highly recommended the lovely Del Rio Riverside Resort – there are many options there from camping to deluxe villas, plus activities to keep all the family happy. Check prices and availability at Del Rio Riverside Resort here. So there you go, you’ve not got the gen on what to do in Wisemans Ferry! Wisemans Ferry really is a must-visit for families. Enjoy the beautiful scenery, go to pick your own mandarins in autumn / winter, relax in one of the family friendly eateries of Wisemans Ferry or go for a picnic and let the kids burn some energy. Now, that you have read the article, you know why we keep going back to Wisemans Ferry. Have you visited? What’s your own hidden gem there? Find more simple day trips away from Sydney here. Check out lots of wonderful weekend aways from Sydney on this post.